I have ordered and will be receiving 4 yards of double width PV Friday. I have a copy of TAoK, and was wondering if there is anything different that I need to do with PV than wool. You say to tear wool in half instead of cutting, does this apply to PV as well? I can't imagine there is a whole lot of difference in the construction but I so far haven't found this addressed in the book. Thanks for your advice. There are a couple of differences when working with P/V v.s wool. First - P/V does not rip as well or as easily as wool so in most cases you cut P/V. P/V will not take the compound curves with steam that wool will so for places like the apron taper you will need to use straight lines. You will not be able to fabric mold the P/V like you do with wool so all of the steam shaping that is explained in TAoK will not work as well. And the temperature that you set you iron to is more critical with P/V than it is for wool. If the temperature is too hot you will melt the fabric. If too cool the fabric will not form a crease. If set just right the creases will be almost permanent. P/V is less forgiving of stitching errors than wool so your accuracy and absolutely straight and even stitches are a must. If pv does not shape as well, would it be more advisable to keep the split closer to 1/2? I'm sorry, but what would the moldability of a fabric have to do with the measurement splits? Do you have a copy of "The Art of Kiltmaking"? Author of "The Art of Kiltmaking"
Steve has a LOT more experience than I do with PV (I've only ever done a few kilts in PV), so he's the best one to give advice for how to work with the material. The only thing I'm going to add is that how you split the measurements does govern how much shaping you have to do in the apron and underapron edges. TAoK suggests splits that put more in the apron at the waist and more in the pleats at the hips, which serves to reduce the shaping needed on the edge of the apron and underapron and puts more shaping into the pleat taper. Because pleats taper along a straight line, that's a place where you can do shaping of the kilt in PV without having to do it along a curve. So, my analysis is that splitting evenly would actually make matters worse, not better. Perhaps the issue here is one of symantics. I use the term "shape" to mean the dimensions of an item. i.e. a triangle is a shape. I use the term "shaping" to mean what you do to a flat piece of fabric to "mold" it, allowing it to conform more easily to a 3 dimensional human form. Take any piece of paper and fold it on a straight line. On the back side of the fold the paper will lay flat. If, however you attempt to fold a piece of paper on a curved line, in the back, the paper will no longer lay flat. With wool the back side can be shaped with steamand it will distort and lay flat quite easily. Poly/Rayon fabric is less forgiving of shaping so will be harder to mold to lay flat. Last edited by Steve Ashton; 4th August 18 at 07:05 AM. As pv doesn't mould very well, I was just thinking the less you had to do, the better. I have never made a kilt before, so I was guessing. In my research, I have not found good instructions on making a kilt with pv, though it is commonly used by a lot of people looking for a little cheaper material. I do appreciate both of your knowledge. You won't have much longer to wait. The specifics of this new book are based around 4 issues which I call the DFF&P difference. The "D" stands for Durability. Increased Durability to allow the kilt to be worn every day without distortion, stress or coming apart. The "F" stands for Fit. Allowing a kilt to be designed to be worn at something other than the anatomical waist. The Second "F" stands for Fabric. 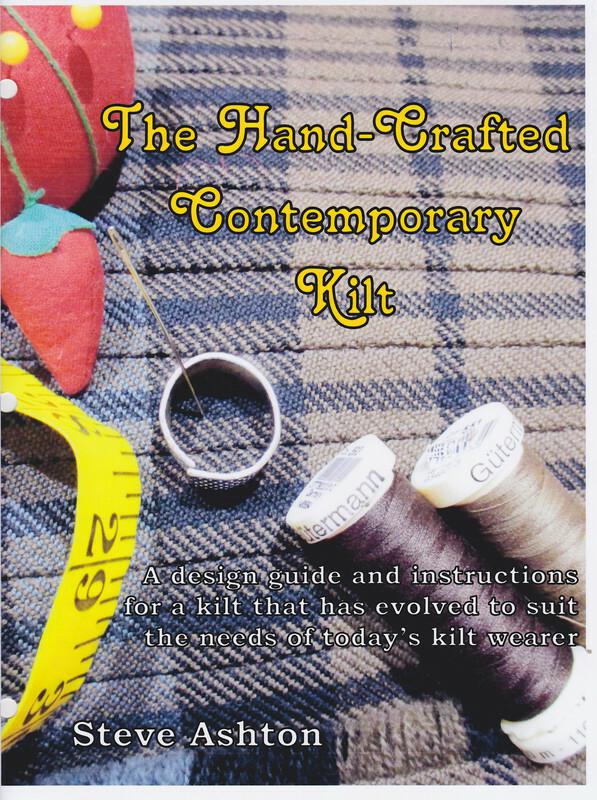 To allow a Kilt to be made from a wide array of fabrics including Polyester/Rayon blends or P/V. And finally the "P" stands for Pockets. What other man's garment today does not have pockets? I have been waiting for this book for a week or two now. Do we have release date yet? I can't remember if I saw a date.